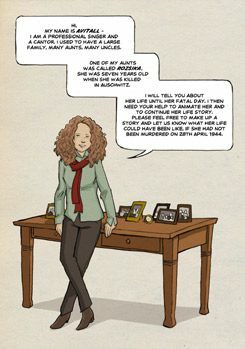 A Jewish girl who was killed in the Holocaust lives on in a graphic novel, teenagers helping to write the continuation of her story. An interview with Avitall Gerstetter, a cantor for the Jewish Community of Berlin and the initiator of the project “We will call out your name”. Ms Gerstetter, if your great-aunt Rozsika were still alive today, where would she be right now and what would she be doing? Those are precisely the questions which the project raises and which I often ask myself: what would have become of the people who were not fortunate enough to survive the Holocaust? And what would their lives have been like if the Holocaust had never even happened? If I were to answer these questions now with respect to Rozsika, however, I would be anticipating what is yet to come, as the story-tellers have not yet worked out what is to become of this girl who was killed in Auschwitz at the age of seven. You are currently developing the story for a graphic novel and have invited young people to contribute to it. You also appear in the story yourself. Serving as an intermediary from the present day, a living person, I make it possible for readers to access the story directly. Characters like Rozsika and her friend come to me – symbolically speaking – across a bridge; I take them by the hand and show them how I live today. They in turn tell me about what their life was like back when they were young. I go with them through the years – and in the process they grow up, leave school and learn a profession. When we talk about researching and critically analysing the past, we generally mean examining witness accounts or uncovering historical facts. What you are doing is something entirely different – you are creating a work of fiction. Why? Scene from “Rozsika”; | © Tobias Dahmen/Avitall Gerstetter It was a speech given by former Israeli president Shimon Peres in Berlin that gave me the idea for We will call out your name. In it, he asked what the Holocaust victims would want us to do today. His answer was that we should continue to tell their story. This seemed very logical to me. The voices of those who are able to report on the crimes from their own experience are becoming ever weaker. We need a new way of ensuring greater identification. I believe it is important for young people in particular to engage intensively with the biographies of the victims as this is the only way in which they will really come closer to the various characters rather than simply observing them from the outside. Can your approach also be regarded as a break with “conventional” forms of commemoration? Absolutely. What I want to do is create a new culture of memory. I want young people to pay tribute to the victims not only in the typical dry way that usually happens but to encourage them to give free rein to their thoughts. Today we are dealing with a new German society, with generations for whom the Shoah no longer has any direct relevance. Nonetheless, they should never forget what happened in the past and they should not forget the people who were killed. The moment we stop talking about them, they will really be dead. Reading out their names once a year is important and a good thing, but I believe it is even more crucial actually to engage with the genocide. After all, it comes as a much greater shock if one is able to really identify with a person. It is indeed a shock, but is there not also something comforting about “letting them live on” in this manner? Definitely. There is something comforting about not allowing these people to be forgotten, about hearing their names again and about the fact that we are still talking about them despite their having long ceased to be among us. This is the only way in which they can live on – which incidentally is a very Jewish philosophy. A young adult novel could also have served your purposes. So why a graphic novel? I felt that it was important to give the characters a face so that young readers could grasp them with all their senses. It is not enough simply to write about these people and use words to describe them. The new, modern form of the graphic novel seemed better-suited to this purpose. Many graphic novels deal with extremely serious subjects in a way that is not overly heavy but nonetheless leaves a lasting impression. This medium is well-suited to today’s fast-paced, Internet-oriented world. How exactly is the project proceeding, and at what point does the “interactive section” begin – the part to which teenagers can contribute? Working together with an author and an illustrator, I narrate Rozsika’s story up to a certain point. The idea is to present the starting point and provide a foundation upon which the teenagers can develop the story. Then it is their turn to get involved and to imagine how the story of the girl and other characters might continue. We will incorporate some of their ideas into the graphic novel, as well as some topical issues and life histories from the present day. Will this ultimately result in one major collaborative publication? As far as I am concerned, this is an ongoing project – we do not want to create a single “end product” but to produce a contemporary novel that will continue to move forward. The idea is to call the victims to mind time and time again, yet without losing touch with the present day. Helen Sibum conducted the interview. She is an editor based in Frankfurt am Main.